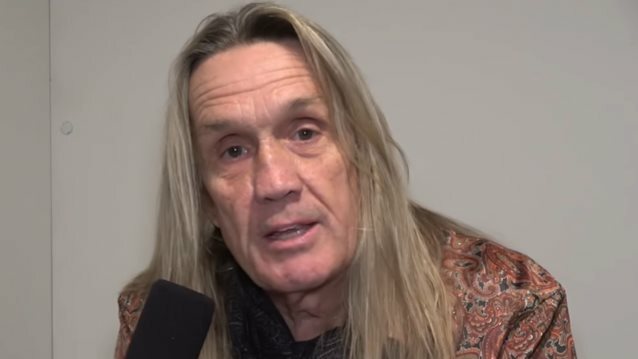 Vintage Rock 's Junkman conducted an interview with drummer Nicko McBrain of British heavy metal legends IRON MAIDEN on January 22 at the 2017 NAMM show in Anaheim, California. You can now watch the chat below (captured and edited by Mike Thoman). Speaking about MAIDEN's plans for 2017, Nicko said: "The big year was last year, really. 2016 was the year around the world with [MAIDEN's new-and-improved branded private tour plane Boeing] 747. It kicked off in February last year and went through to August. We decided after we did the six months — mostly everywhere; we played a new territory, went to China and El Salvador, places like that, [for the] first time, which was immense — but we decided that we really didn't do a British tour. 'Cause we haven't done a full British tour in years. So the idea was, well, okay, let's go back to Germany, do a few shows over there, kind of get us back into playing before we hit the British tour. So I think we're doing five or six shows in Germany. Antwerp [Belgium] is the first gig [on] the 22nd of April. Off we go through Europe, back to England, do twelve or thirteen dates… I'm not sure exactly how many shows we're doing… probably twelve or thirteen. And after that, we come over here [to the U.S.] and we kick off." He continued: "The reason we're doing [a U.S. tour this summer] is because the first part of 'The Book Of Souls' tour, I think we did seven or eight shows in America… My memory may be wrong… You can go, 'No, you did ten…' We didn't really do an American tour. We did four shows up in Canada, and I think we did ten total before we went across the water. So it was decided, 'Let's come back,' so we've got a six-week tour of the States. It starts June the 3rd and it finishes the 22nd of July. So that's a nice little jaunt across the U.S. for us. And that's it — that's it for MAIDEN for this year." Support on MAIDEN's U.S. tour will come from GHOST. There will also be some further bands added to the show at San Bernardino.